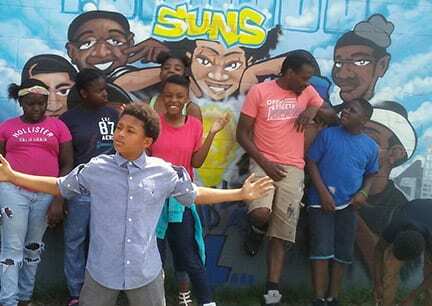 NASHVILLE, TN — The Metropolitan Art Commission in collaboration with restorative Justice JJC Judge Sheila Calloway’s Court requested nonprofits and others to submit grants for art projects to restore youth through ART. The African American cultural Alliance submitted a project proposal to MAC/ Restorative Justice and it was accepted! The project entitled “Reach for Stars” a program for instructing, motivating, and inspiring young people through graphic art began May 13th and continued through July the 6th. The participants were provided by Miss Clemmie Greenlee Community activist and youth mentor. The classes were held at McGruder Center the instructors for the artproject were famous. Mural Artist Joseph love the third and Mike Mucker “old school” Mike. Participants ranged in age from 12 to 17. The number of participants overall averaged 8. The young people learned, not only the basic art skills and air spray painting skills, but also they learned to respect themselves, to respect their mentors, and their teachers as well as to respect their community of North Nashville. These young North Nashvillians were exposed to the wonderful murals along Jefferson Street and the art at Fisk University. Some of the artists work at Nashville’s Farmers’ Market. They participated also in the bicentennial art festival. The young people expressd such interest in coming to the classes each Saturday that when Transportation seemed not to be on the way, they walked. The project ended in a great awards banquet held at Pleasant green Missionary Baptist Church. Thank you to all of the collaborators that made this successful project. Reverend Gates of Grace Covenant Church provided the van for transportation, Pleasant Green Missionary Baptist Church provided the fellowship hall at no cost, Clark Memorial United Methodist Church provided tables and other equipment and to Coya Coalition of Youth Artist who also helped participate in the project. We also would like to take our hats off to Cecilia Tribble and Rebecca Berrios of the Metropolitan Art Commission, the North Nashville Community project counselors. We reached for stars and we found them in these wonderful young people. Thank you to African American Cultural Alliance and their staff for serving as non-profit administrator. Thank you to A. Haddock of McGruder Center, Joy of Gumbo Goddess Concessions, Slims and Huskys Pizzaria, Sandra Brown, and Mr. Kwami Lillard for ther contribution to make this project a success.